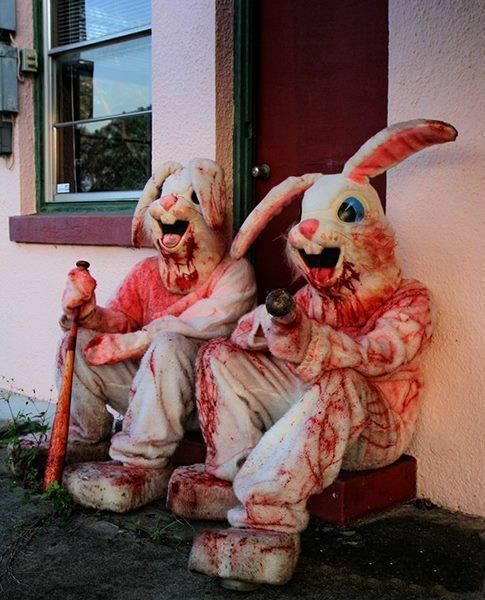 Brings the two biggest aspects of Easter together... blood cult and the bunny thing, like Reese's did with Peanut Butter Cups. Did you spend Easter with the Devil DC? (04-17-2017, 12:22 AM)JayRodney Wrote: Brings the two biggest aspects of Easter together... blood cult and the bunny thing, like Reese's did with Peanut Butter Cups. I agree. As a kid I always knew there was some kind of satanic aspect going with Eater. At what other time of the year is it socially acceptable for old guys to do cosplay by dressing up as pink rabbits and manhandling little kids without any real idea of who is under that costume if they suddenly try to steal your kid or your kid suffers from PTSD years later and you need to sue them. It just ain't right I tell ya. It is really make the hair stand up on you neck creepy.